"Brett Lee?!" a friend of mine once said rather incredulously, "he looks like Dave the cricket!" And I realised that she had a point. 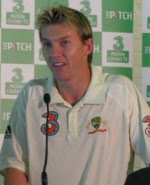 I and my friend, A, unanimously agree that Brett Lee loses half of his charm in casual wear. There's something about the cricket uniform that makes him a super hunk. Give him a tee and trouser, and he's just a guy next door. Yeah that's true. But the uniform can make just about anyone more attractive. It's some association!